As part of our Caring For Kids campaign every year, we sell raffle tickets for a chance to win a brand new car. The raffle is a huge fundraiser that our guests look forward to and back in December, we visited Children’s Hospital of Pittsburgh of UPMC to pick the winning ticket. We recently presented the winner, Diana S. of Luthersburg, PA, with her brand new 2018 Ford EcoSport! Diana purchased the winning ticket from Troy at our DuBois Eat’n Park. Diana (seated), our Car Raffle Winner, was excited for her new ride! We'd like to thank our friends at Neighborhood Ford Store for graciously donating a vehicle for this raffle. 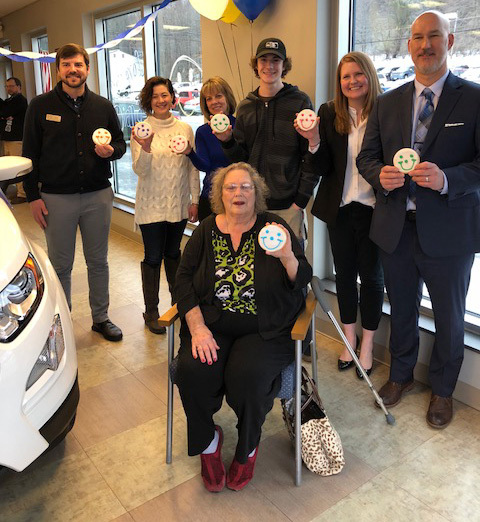 Our car raffle generated about $74,000 for our Caring for Kids campaign, which benefits local children's hospitals throughout our company’s footprint! Enjoy your new ride, Diana! Send Smiley to the Moon! Coupon for $2 Off Your Next $10 Online Order! New coupon for $1 off your pie purchase! Take $3 off your $20 purchase!